I’ve just returned from a trip to South Africa, visiting the winelands of the Western Cape as well as attending Cape Wine, the South African wine industry’s showcase. This was my sixth fact-finding trip to South Africa since the turn of the millennium, and I can honestly say – hand on heart – that it was the most invigorating visit yet. The palpable sense of excitement that was hinted at on my last visit in 2013 has blossomed in 2015. It was almost as if the clean, crisp air of the Cape winelands in spring crackled with electricity: so many startlingly good wines, so many winemakers exuding quiet confidence, and round every corner new things to be discovered and new stories to be told. For the past decade one could be forgiven for thinking that Swartland was the be-all and end-all of modern South African wine. The explosion of interest in Swartland was down to the sheer quality of the wines being produced there, but also to the attitude of its handful of pioneer winemakers. That handful has now swelled to a small battalion; it seems like new names appear almost every other week. But the ethos of the Swartland revolutionaries has not changed: celebrating the Cape’s most ancient vineyards and giving them the respect they deserve, farming as organically as possible on the best terroirs, and making wines with minimal intervention. All of that still lies at the heart of the Swartland philosophy, but if the ‘Swartland effect’ has been good for consumers, it has been even more significant for the entire South African wine industry. Many of those principles are being carried forward by an ever-growing band of winemakers across the Cape. Many of these are also of a new generation – the post-apartheid 20- and 30-somethings – who have grown up in a very different South Africa. But that’s not to say that the Cape’s most venerable estates in Paarl, Stellenbosch and other established regions have stood back or resisted change: once again, enthusiasm for change and improvement is everywhere. A return to fundamental principles and to artisan thinking is being echoed in wine regions across the world at present, but in the Cape I felt it so acutely: there is a desire to prove that South Africa has the grapes, soils and climate to make great wines in a global context – and winemakers who are intent on realising the promise of the past 20 years of rapid development. This is the first of a series of features from my visit which will build into a comprehensive report on South Africa 2015. I vividly remember my first visit to the Elgin Valley back in 2002. Then there were only a couple of wine estates in this apple-farming region 70 kilometres south east of Cape Town. But already many producers from more established regions of the Cape were sourcing fruit from there, recognising that this genuinely cooler-climate zone could produce something special for Chardonnay, Pinot Noir and aromatic grape varieties like Riesling, Gewurztraminer and Sauvignon Blanc. Today there are around 20 estates and, whilst the traditional crop of this region – apples – still dominates, more and more vineyards dot its rolling slopes. The secret is that cool climate. Elgin sits on an elevated plateau, accessible only via four mountain passes. Like an upturned saucer, the altitude rises between 260m and 500m above sea level. Lying between five and 20 kilometres from the ocean, its average temperature in peak of summer (February) is only 19.7C, falling to 16C in March as harvest approaches. There is a lot of cloud cover, and south-easterly winds create a cooling effect, with night time temperatures allowing grapes to retain acidity. In September 2015, the wine growers of Elgin staged a fascinating event to demonstrate the quality of Chardonnay being produced in the Valley. An expert seminar was led by Master of Wine Richard Kershaw, who also makes wine at his eponymous estate, one of the most respected in Elgin. 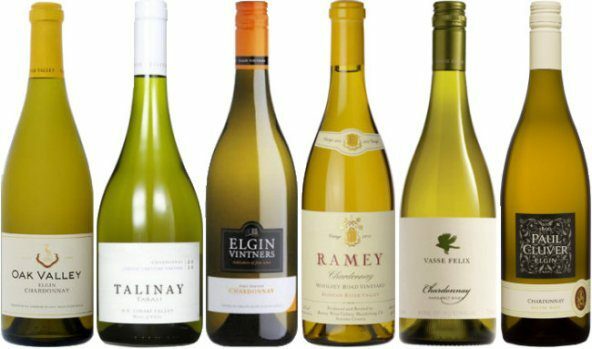 In the seminar we would taste 12 world Chardonnays ‘blind’, without knowing the order of serving, origins or prices, only that six would come from Elgin and six from other Chardonnay hotspots. But first, Richard explained some of the aspects that he thinks make Elgin so special. His first point was to reiterate the genuine cool-climate credentials of Elgin (so many world regions claim to be ‘cool’, but it is often a highly relative term). “It is,” said Richard, “by any measure the coolest wine region in South Africa.” One key measure is ‘growing degree days’, a summation of the productive hours of heat each day times the length of the growing season. Elgin experiences 1,500 degree days on average as opposed to 1,950 in Stellenbosch or 2,150 in Paarl for example. But cool climate is also concerned with things like total rainfall, summer rainfall and evaporation levels. 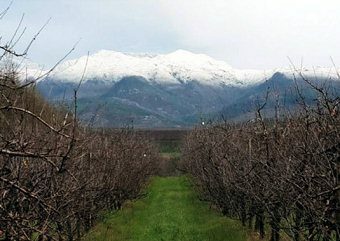 Evaporation is extremely low in Elgin, so there is very little need for irrigation: “dew points are reached earlier,” explained Richard, “so grapes stay damper for longer, keeping their temperature lower.” Right: Elgin in winter, photo courtesy WOSA. The harvest for Chardonnay tends to be up to two weeks later in Elgin than in most Cape regions – “harvesting in Autumn, not Summer,” says Richard. Scientifically, that means compounds called Terpenes and Norisoprenoids develop earlier, triggered by coming winter, that added layers of complexity to aroma and flavour. Slow ripening means grapes are picked at quite low sugar levels, usually resulting in wines of just 12.5% or 13% alcohol in bottle. Acid adjustment not usually necessary.Finally, Richard came onto the subject of oak which, with cool climate Chardonnay in particular, he says “must be a sparring partner with the fruit, not an opponent.” With a reminder that 2014 was “possibly the best Chardonnay vintage in Elgin of all time,” we moved on to the blind tasting. The first thing to say is that the notes below are exactly as written during the blind tasting and, as you will see, for the most part my conclusions on the origins of the wines were surprisingly accurate. 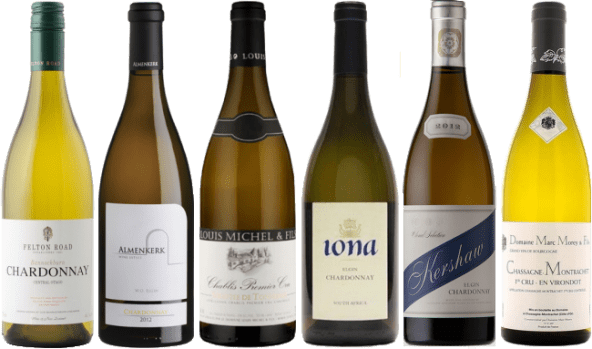 Surprising because Chardonnay is capable of being moulded into various styles by the winemaker, and the differences between wines from different origins is not always as obvious as you might think. I think my performance in identifying the wines was down to a couple of factors: yes, I was on pretty good form, but also, the samples chosen were good representatives of the ‘classic’ styles of their regions. Most importantly, the six Elgin wines hidden amongst the 12 were really quite distinctive. I think this has to do with the sheer clarity – the luminosity – of their fruit and their acidity. It was certainly a superb showing for Elgin Chardonnay, and an utterly convincing demonstration of quality. (2015) Lovely nose, with all the crushed oatmeal and gentle almond, a little orange and lemon juiciness too. Very finely wrought but does seem to have the clarity of a a very cool climate Chardonnay. Very racy and fresh on the palate. Does it verge on a touch of dilution? No, it is fine with a salty mineral finish, and pure. Could be something like a 1er Cru Chablis, but I think this is most probably Elgin. Tasted Blind. (2015) Slightly deeper colour but still fresh and green. Much more subdued aromatically. The palate delivers a bug burst of flavour - fresh apple and citrus, the oak perhaps just stifling it slightly, a big lemony thrust of acidity in the finish does not seem absolutely harmonious - just a bit too citric? A New World wine I think, but not Elgin. Tasted blind. (2015) Back in a very seductive and perfumed oatmeal and gentle toast/coffee mould. The palate again has that pure, mountain-stream clarity of Elgin. Vivid green apple and citrus and that hint of minerals. Reminiscent of wine one, a little richer, but from the same place: Elgin. Tasted blind. (2015) Again a richness of the oak here, with a blast of citrus. Plenty of oak and a sunny disposition to this, suggesting perhaps a warmer climate - Australia or California? Lovely fruit forward stuff, perhaps a little more obvious than the other wines, a little more bountiful, perhaps a little more alcoholic too. But beautifully done. Tasted blind. (2015) Quite a lot of coffeeish oak on the nose - no shortage, with a brazil nut butteriness and plenty of tropical fruit. The palate has lovely sweetness of fruit, with a salty mineral finish. Quite a striking finish, a touch austere, maybe just a hint of falling away right in the finish? A modern style Australian from Adelaide Hills perhaps? Tasted blind. (2015) Much lighter oak quality here, much more melon skins and a bit of grippy skin contact perhaps? The palate has quite a full texture, a really lovely juiciness and much more concentration that the previous wine. A really bold and flavourful wine with excellent balance and persistence. Quite a natural wine feel to this and lovely clarity. Very good, very possibly Elgin. Tasted blind. (2015) Quite subtle, very lightly oaked. The palate has a lot of sweetness, a really ripe sweetness but perhaps not the ultimate balance or complexity of some of the others. Not sure where this would be from - possibly New World? Tasted blind. (2015) Very fine, a touch of minerality and flint - immediately guessing Chablis. Tight, with complex sulphide gun-smoke notes, a very juicy profile and good persistence. A lovely Chablis. Tasted blind. (2015) Plenty of creamy oak and ripeness, but some floral and aromatic character with the palate boasting loads of fat lemony fruit that is racy with a glittering acid quality. Could well be Elgin, and a wine with lovely fruit, apple acidity and cool qualities, even orangey in the finish. Delightful.Tasted blind. (2015) This has brightness and fruit, plenty of New World punch. Ripe and creamy, with a great deal of brightly focused tropical fruit. Lovley length and full of the brightness, the clarity of Elgin. Tasted blind. (2015) Lovely nutty character with really dry acid structure, I am guessing this is France again, maybe northern again, if not Chablis then maybe Puligny? Lots of racy character but beautiful balance and the saline lick of the finish.Tasted blind. Price is in-bond. (2015) Shannon's blend of five different clones of Merlot from France and northern Italy. Has terrific fruit brightness and cherry and red plum, the gentle cedar and intense concentration. This has massive concentration and energy on the palate, yet without any over extraction. Spicy and fruity. (2015) Lifted and gamy with loads of ripe black fruit and creamy, very solid but beautifully plush and moreish. Long and creamy in the finish. 71% Cabernet Sauvignon and 29% Merlot. (2015) Syrah and Cabernet dominated blend. Fabulous schist and black fruit lift, the intense black fruit edge with acidity and yet a chocolate depth, spices and structural tannins beautifully supportive. The creamy oak embellishes the finish but it remains so crisply fresh. (2015) Single vineyard with 24 months in older barrels. Schisty and cool on the nose, the very sweet, very ripe fruit. Delicious and terrific acid keeps it very fresh. Not in UK at time of writing. (2015) Pale colour and gorgeous perfume, all floral and briar, the soft truffle and woodland note, the very fresh acidity and lean profile, perhaps a touch more flesh would be nice, but the trade off is that freshness and alertness. (2015) This has a fine schisty, rhubarb and fine earthy quality. So deliciously pert and focused, so light on its feet, with a little coffee and terrific length. Gorgeous wine, so balanced. (2015) Lovely schisty blackness with a smooth berry fruit and lots of sweet fragrant and floral notes, really pure and deliciously long. Not in UK at time of writing. (2015) Lovely spicy qualities, some chocolate, and good fruit quality, bursting with sweet fruit and spice. Long and balanced, such good fruit. (2015) Beautiful fresh cherry, only 12% alcohol. Absolutely gorgeous with its intense perfume and full ripeness but such beautiful fruit and spicy length. A fabulous Pinotage on the Pinot side, but not losing Cinsault juiciness. (2015) Quite exotic ginger and spices, a bold fruit but not too obvious; has some subtlety. Long, not quite as fully layered as some but I do love the freshness. Not in UK at time of writing. (2015) Lovely creamy and oatmeal nose. Plenty of ripeness and oatmeal and a really fresh orangey fruit. (2015) Gorgeous crushed fine oatmeal and almond, lovely nuttiness and finesse before bright fruit, but this really expresses its mineral and salt coolness. So juicy and fresh, the hint of tropical against the fresh squeezed lemon. (2015) Wow, hugely lifted with masses of wax and some petrol, fabulous stony minerality, bone dry but zingy fresh. Fabulous. (2015) Has a little touch of very cool pea shoot character, but also some wax and minerals, the palate is just off dry, with a beautiful balance, lime but hinting at ginger and more complex characters. Not in UK at time of writing. (2015) A blend of 60% Sauvignon and 40% Semillon. A lovely hint of buttery ripeness, rich and a touch leesy and lanolin. The barrel component adds such beautiful nuttiness but in a very graceful style. Not in UK at time of writing. (2015) Has a lovely lifted and punchy vibrant nose, some asparagus and green, but has a lemony freshness too - a beautifully fresh directness. Not in UK at time of writing. (2015) Very different, more of a flinty, stony character but the juicy grapefruit, some rounding weight and texture but all about the piercing freshness again.